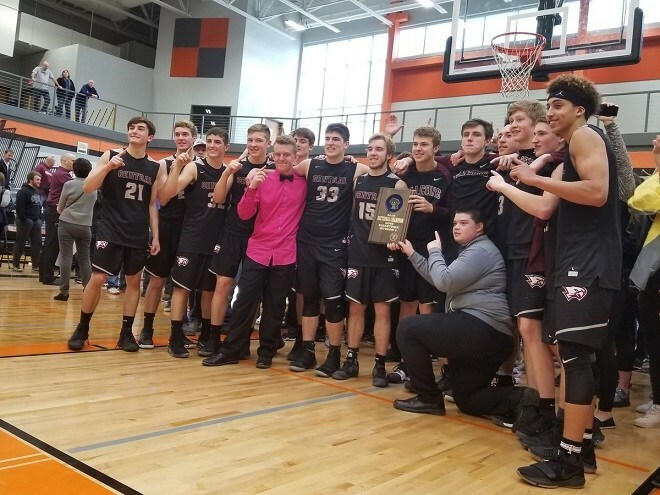 Westosha Central High School earned its first boys basketball state berth in school history last March at Oregon High School (Mike Ramczyk/The Report). In 2017, Westosha Central came up one game short of reaching the WIAA Division 2 state tournament series at the Kohl Center in Madison, but then Falcons came back the next year looking for redemption. The redemption happened last March, when the Falcons defeated Elkhorn and advanced to the March 10 sectional final at Oregon High School, where they entered as underdogs against top-seeded Monona Grove. No. 2 Westosha Central, however, did not allow its underdog status to stand in the way as the Falcons edged the Silver Eagles 76-55. With the win, the Falcons claimed their first sectional title in school history. From a Kenosha County perspective, the Falcons flew in rare air, considering only five other county teams have made a state boys basketball appearance since 1941. Meanwhile, within the Western Kenosha County community, Westosha Central Athletic Director said the school’s historic achievement created a new atmosphere. “Last year, we advanced to the sectional final and the whole atmosphere around the program and school really started to ramp up,” said Lindh. Lindh recalled a conversation he had his with his father, a strong supporter of the program and high school level coach of more than 30 years, after the Falcons secured their first sectional title in program history at Oregon High School March 10. Westosha Central, which lost the state semifinal to Kaukauna, finished its season with the most wins in school history with 22.